Harbor a Block From this In-Town Bungalow. This tranquil retreat is totally updated yet retains the charm of a Craftsman style bungalow. From the large deck view the bay and adjacent 4+ acres of rolling conservation field. Walk under the stately elms, past the historic homes to Dyces Head Lighthouse; sea-kayak or chill on the town's sandy beach or active harbor. Located on a quiet street just a few blocks from the village center. Built in 1932, the house has natural woodwork throughout and features a stone fireplace in the living room. In addition to the living room, the first floor has a den, bedroom, full bath, kitchen and dining room. Upstairs are two bedrooms and a full bath. The bungalow has near new bedding, couch and chair, and futon, two LCD TVs & DVD/CD players, etc..
Heavenly Daze. Well-crafted, fully furnished and handicap accessible home perched on rugged ledges in an enchanting and private woodland setting. Completely renovated. Glorious sunsets, simple and inviting gardens, footpaths. Just steps to a picturesque typical Maine beach. Main house has spacious master suite including walk in shower with heated tile floors. 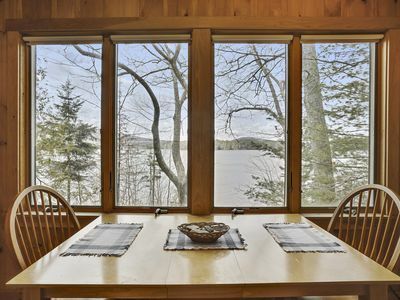 This house has one floor with fully stocked kitchen, family room with floor to ceiling windows looking out on Penobscot Bay, vaulted ceilings, exposed natural wood beams, a centrally located wood stove fireplace perfect for a cold fall evening. Having friends join you for a few days….the fully furnished one bedroom apartment above the detached garage has a kitchenette, full bathroom, living area and queen size bed is perfect for guests. Charcoal grill for slow and relaxing dinners and an ocean side landscaped fire pit perfect for s’mores while you watch the stars. The house is on an island. there is a car ferry that runs between the mainland and the island every 30 minutes from 7 am to 5 pm 7 days a week and a smaller non car ferry that will run into the evening or anytime per request. Islesboro has 2 country stores with all the provisions one would need to make a 5 course meal. There are a few small shops and even a great place for ice-cream. The Island however does not have any restaurants so if you are looking for wild nights out its probably not the place. We have in the past taken the ferry back during the day and go to Camden for lunch and window shopping. The Island is famous for its large mansions that are owned by such Hollywood stars as John Travolta and Kristy Alley along with a smattering of hedge fund traders and bigwig lawyers. People come to Islesboro to get away from the crowds and recharge their batteries. It is tradition to give a wave while driving to fellow drivers and walkers! No pets or smoking please. 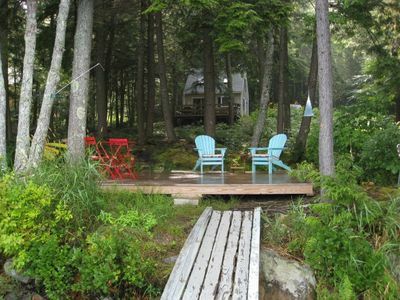 BirchView is a beautiful summer cottage on a spring-fed lake, five miles inland from Mid-Coast Maine's ocean. It has been our private summer home for over 35 years. Our children are grown and gone with their own families, and so , we have opened it up to rent to selected guests who will love it and care for it as much as we do. Built in 1924 in a pine grove secluded from the eyes of neighboring cottages, BirchView is large -- 3,000 square feet -- and is completely furnished; 3 bedrooms with new queen-sized beds, one room of which also has a child's bed; 2 full bathrooms; 32-ft eat-in kitchen; a 12 foot dining table in the lake room to enjoy your meals while watching for loons and eagles; a library with a fireplace, two comfy sofas, a reclining chair, thousands of books, and hundreds of family-friendly video tapes; an upstairs living room (adjacent to the bedrooms) with sofas and chairs that overlook the lake. We face west and are blessed with the most beautiful sunsets imaginable! Please enjoy our private beach, kayak, and giant inner tubes. Fed by 3 fresh-water springs, Swan Lake is pristine, quiet, and small -- only 3 miles long. For those who worry that a Maine lake may be cold, let us assure you that the water temperature is usually 76 degrees, very refreshing. (The nearby ocean, on the other hand, is 55 degrees!) July and August are our best months weather-wise, but may I tell you how gleeful I was to experience my first September as a retired teacher? I learned quickly what all Mainers already know: the September lake is still warm and highly swimmable. Days are sunny, nights are cool, and maple trees are busy preparing for Show-and-Tell. Here's hoping another retiring teacher will love Swan Lake in September as much as I do! October is a mind-blowing kaleidoscope of color, but you will need your down-filled sleeping bag at night! Sara, a previous guest had this to say about BirchView: "We had an absolutely wonderful time in this quintessential Maine lake camp. It is right on the lake, and the panoramic beauty of the place is all around you. The lake itself is cool, clean, and there are virtually no motorboats. I went swimming each and every day. Melinda is an engaged and engaging hostess. She knows Birchview like the back of her hand, and was exceptionally generous in sharing her wisdom with us. Thus, we became acquainted with some of its less obvious delights (eagles at dusk, lucky pebbles, etc.) far more quickly than if we had been lurching around on our own. The property is very special. Some aspects of its layout are ingenious - like the attic windows that open, just under the eaves, to let fresh air flow through the house - keeping it lovely and cool, even in the 90° weather we had last week. The fireplace is the soul of the house, and we found ourselves gathering there in the evening to toast marshmallows, watch classic Disney films, read, or do puzzles. The bedrooms, especially the two that face the lake, are incredibly cozy. The place is spacious and open. If I could go back tomorrow and stay a few more weeks, I'd do so in a split second." As the only guests, you will have full access to the cottage, but please note that Birchview is not wheel-chair accessible. There is a short, easy down-hill walk from the private parking area, and another very short walk down to the lake. 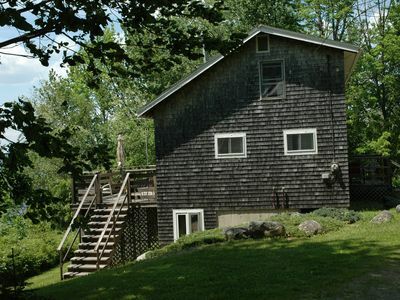 (The cottage itself is two floors plus a loft.) Therefore, all guests must be sure-footed and ambulatory. The cottage is fully supplied. Fresh linens, sheets, and towels will be provided to guests who are flying to Maine. Guests who are driving are welcome to bring their own favorite sheets, blankets, and pillows. The cottage draws its water from the lake. It is suitable for bathing and washing dishes, but we no longer drink or cook with it. Bottled water will be provided. Please note: By choice we have neither an automatic dishwasher, nor a clothes washer. This is a summer cottage, after all, designed to access the Happy Camper in each of us! There is no internet, but we have tons of books, games, and videos. Cell phone coverage cannot be guaranteed; it depends on your phone and carrier. I am a rockhound. I spend hours patrolling the beach, looking for interesting rocks. The lore in my family (and others as well) hints that rocks with an unbroken circle are "lucky" rocks. Our beach has loads of them. It also has spectacular green granite rocks. In the library you will find lots of lots of rocks I have collected from our beach throughout the years. 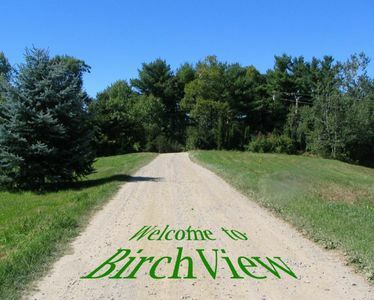 Maybe BirchView will encourage you to take up a new hobby! We suggest that first-time guests to Maine try to arrange a two-week stay because there is so much to do and see, all within driving distance. The cottage rental fees reflect this suggestion. First week, $1500, second week $1300, plus the fees charged by the agency. Near by we have Acadia National Park; Bar Harbor with shops and whale sight-seeing adventures;, even a fast ferry to Nova Scotia. Mt. Katahdin, the northernmost point of the Appalachian Trail; Belfast, a very charming harbor town with lots of shops and art galleries; Camden, the harbor town which Walter Cronkite called the most beautiful in America; Old Orchard Beach with big ocean waves to jump around in, and Funtown a fantastic water park which delights children and adults alike. For lighthouse buffs, there are several in the area; breakwaters, too. The ferry boat in Rockland goes to the famous, little islands off the Maine coast and welcomes cars, bikes, and pedestrians. 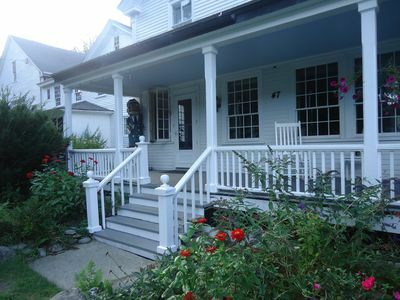 Charming cottage just a few feet from quiet Tilden Pond with screened porch. Kitchen is well equipped. Southwest exposure for outdoor dinners and great sunsets. Loons, bald eagles, wild turkey, cranes, osprey, beaver, otters, and moose are sometimes seen. Fishing poles and canoe are provided as there is great small and large mouth bass fishing. Only six miles to Belfast and coast. Wonderful place for canoe or kayaking, swimming, fishing, and birdwatching. This is a special spot. 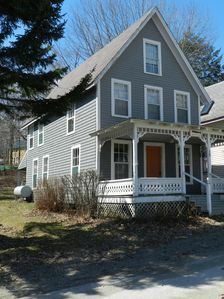 Come enjoy a 22 room, 10- bedroom 1800's rustic farmhouse overlooking Saturday Cove in Northport, Maine. Ideal for large weekly rentals. Seven acres of gardens, orchards and trails are carefully set up on a hillside above Penobscot Bay. A Large parlor, library, dining room, master bedroom with full bath and large walk-in closet highlight a 10 bedroom retreat that has maintained the charm of the 19th century as well as some outrageous wallpaper from past decades. A wrap around porch offers pleasant evening sunsets. An elegant covered deck and stone terrace provide beautiful views toward Isleboro, Penobscot Bay and unforgettable sunrises. Saturday Cove Farm is perfectly located halfway between the historic sea village of Camden and the funky art community of Belfast. Dozens of restaurants and art galleries are within minutes. Sailing, bicycling, hiking and swimming are available steps outside of the estate. Days of the week for arrival or departure are also flexible. If you are up for an adventure stay in one of the enchanting bedrooms and awake to a gourmet breakfast with eggs from our farm or perhaps enjoy a traditional lobster bake with lobster hauled from outside the cove. Guided sea kayak trips and bike tours are also available. Relaxation, solitude and a unique ambiance that truly can not be equaled is what we try to offer with this one of a kind vacation estate. 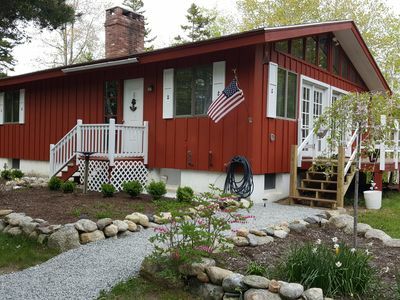 Cove Cottage is a 800 square foot 2 story traditional Maine cottage situated on a quiet, wooded point of land right on the Penobscot Bay! Adjacent Kelly Cove, a sand and gravel bottomed tidal cove that is safe for children and super for exploring and water activities. The cottage was recently renovated and has a master bedroom suite with a high quality, beautifully styled iron pipe framed queen size bed and day bed in a separate sitting room on the entrance level. The bathroom with shower and washer and dryer are also on this level. Downstairs is the living room with TV and DVD player and a large well equipped eat-in kitchen. There is also a deck on this level providing another entrance on the lower level from the living room. There is a gas grill and outdoor seating on the deck. It is tastefully furnished throughout and includes microwave, free WIFI Broadband Internet, DVD/CD player, TV, and central heating. All linens are provided. Normally rents by the week in summer season and by the month during the winter months. Well behaved pets are welcome. Smoking is not permitted in the cottage. 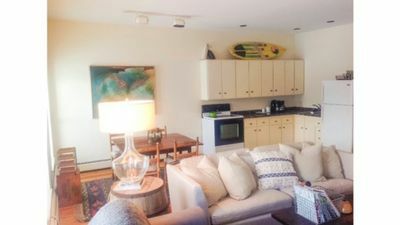 If you are looking for a cozy, relaxing, New England cottage in Mid Coast Maine with you being just steps away from your own private sandy beach then look no further than 19 ON THE BAY ! 19 ON THE BAY is a seasonal cottage that has been fully renovated and beautifully decorated and this one story Sandy Point cottage is ready for you to enjoy. Two bedrooms (queen size mattresses), 1 bathroom with a full sized shower, 2 comfortable living areas with sofas and chairs to relax in and a fully equipped kitchen are just a few of the characteristics of this quaint Sandy Point cottage. 19 ON THE BAY is ready for you to come and settle in. A large, flat screen TV/DVD, books, games, soft bedding and towels including beach towels along with extra toiletries if you forgot something all available for your convenience and comfort. The pantry is stocked with Tea Bags, Coffee, Bottle Water, Sugar, Artificial Sweeteners, Creamers, Sugar Free Chocolates, and everything you need to make Smores on your private Fire Pit. Enjoy ! As far as your eyes can see is the blue waters of the Penobscot Bay which is just a stones throw away. From the wall of the windows in the four season porch, the kitchen, dining room and living room you get to relax and melt away in the sound and the sight of the waves that rush back and forth on the private sandy beach that awaits your feet in its sand. Even when you wake up and look out the bedroom door your view is none other than the Penobscot Bay. As sunlight fills the cottage through the bank of windows that surround the cottage and the sea air flows through its rooms you may not want to leave your comfortable surroundings but you would miss so much. Kayaking, fishing, sailing, swimming, day trips to Bar Harbor, Acadia National Park, eating at Young's Lobster Pound, touring Marine Museum, Antique and Art Galleries. Small towns of Bucksport, Searsport, Belfast, Lincolnville, Camden, and Rockport all bring their New England charm to you with quaint shops, eateries, and beautiful views of the ocean as you travel up and down US1. 19 ON THE BAY provides you with everything you will need to have a holiday that will leave you breathless. Please come and find out for yourself why we call Sandy Point, Maine and 19 ON THE BAY our "little piece of heaven." The cottage is on a quiet private spot overlooking Penobscot Bay. 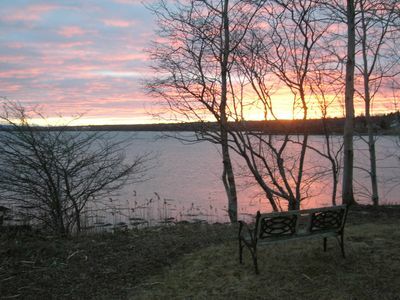 Western views of Penobscot Bay for beautiful sunsets over the water. 900 feet of shore frontage, quiet setting with private deck. A lighthouse across the Bay continues to direct some large vessels to Bucksport. In the fog, you may hear the fog horn sound every 7 seconds. The beach is a great spot for walking, collecting beach glass, and driftwood. Our regulars like to build forts on the beach with the many shapes and sizes of driftwood that wash up. There are also a couple of lakes in the area if you would like to visit some fresh water. We are equal distance to Belfast, Bangor and Ellsworth. Short drive to many coastal Maine towns; 12 min to Blue Hill, 7 min to Castine, 45 min to Acadia National Park, and 60 min to Camden/Rockport. I do my major grocery shopping in Bucksport, a comfortable 10 mile country drive. One bedroom on the ground floor has a double bed, One upstairs bedroom has a double bed and the other 2 twins. Maine has a rich literary history - and if you are bringing your kids, grab a copy of some Robert McCloskey favorites; One Morning In Maine, Burt Dow Deep Water Man, Time of Wonder. We can give you directions to Condon's Garage so you can eat ice cream by the harbor and read these iconic books to your kids. Burt Dow's headstone is only a short drive from there, and the locals regularly adorn it with a painted buoy. We like to think Giggling Gull visits from time to time. Bracken Cottage is located on 32 acres of private woodland with 1700 feet of private beach! West Brooksville. Convenient to all that the Blue Hill Peninsula has to offer! Featured in Cottage Living Magazine! SUNDAY-SUNDAY RENTAL please. Bracken Cottage is the ultimate family vacation spot. 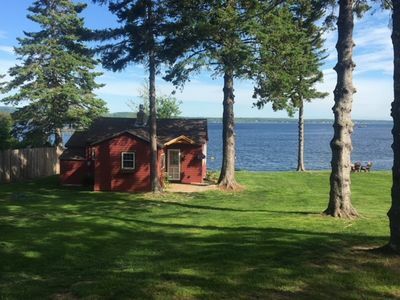 There are two cottages set on 32 acres of beautiful woodlands with 1700 feet of private beach in West Brooksville with close proximity to Blue Hill, Cape Rosier, Holbrook Island Sanctuary, historic Castine and Acadia National Park. In the Main House, relax on the lovely stone patio or screened in porch with wicker furniture, basking in the sunlight while enjoying a meal and views. Escape to the study to cozy up with a book or play a board game. The kitchen has all the essentials and opens up to a lovely dining room with working fireplace. The living room is beautifully appointed with a second fireplace. There is a queen pullout bed in the downstairs study. Bracken Cottage is the ultimate family vacation spot. 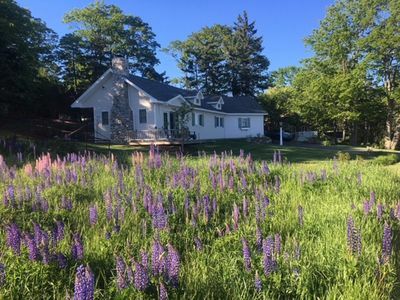 There are two cottages set on 32 acres of beautiful woodlands with 1700 feet of private beach in West Brooksville with close proximity to Blue Hill, Cape Rosier, Holbrook Island Sanctuary, historic Castine and Acadia National Park. In the Main House, relax on the lovely stone patio or screened in porch with wicker furniture, basking in the sunlight while enjoying a meal and views. Escape to the study to cozy up with a book or play a board game. The kitchen has all the essentials and opens up to a lovely dining room with working fireplace. The living room is beautifully appointed with a second fireplace. There is a queen pullout bed in the downstairs study. Sunday to Sunday rental. Rates subject to change. Click "Book it Now" for rates and availability. Many people have told us that our home is one of the most charming on Islesboro. 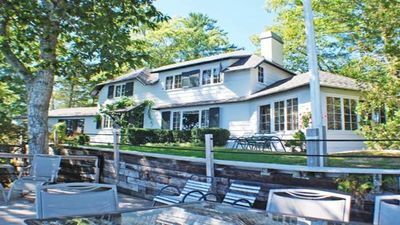 The house retains the character of the original summer house built in 1908, and it sits in a very special place - a narrow peninsula of land giving the house oceanfront at its front and back. A long porch at the front of the house is just 7 feet up and 12 feet back from high tide. And the shore is actually a sandy beach, something very rare along this stretch of the Maine coast. If you are a boater, there are moorings available just off shore. The front of the house faces Sabbathday Harbor & Ryder's Cove, around which cottages such as this one were built around 1900 by families coming down for the summer from Bangor on the steamboats that in those days made regular stops at Ryder's Cove. Further out on the narrow peninsula there is a rocky promontory from which still other ocean views can be had. The whole area has a magic that words cannot describe. The house sleeps 6-10 persons (best fit for ~4 adults/4 children or 6 adults). 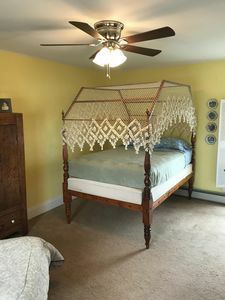 There are 3 bedrooms, 1 additional room, and 1 full bath on the second floor (queen-size bed in one bdrm, two single beds in another, queen size bed in another, and two twin beds in the other room). There is also an office on the first floor with a full size sleep sofa. And there is a half bath on the first floor. The first floor has a large open area for living and dining, an enclosed sun porch, and a kitchen. There are many window on the first floor, particularly on the glassed-in sun porch, which has an especially light and airy feel to it. The furnishings are in keeping with the age of the home. The house was built in 1907/1908. One hundred years later, over the winters of 2007/2008 and 2008/2009, major restoration/repair of the house was completed including installation of foundation piers, restoration of south side porch, interior structural improvements (e.g., stiffening of second floor), removal of modern sheet rock in one bedroom, changes to second floor windows to make them impervious to weather, new hardwood floors, new roof and some new siding shingles, restoration of inoperable doors and windows, removal of thick/peeling old paint on trim and repainting. More recently, in 2011, additional restoration and improvements were made, including installation of foundation piers and new floor for the sun porch; lengthening of kitchen counter with new dishwasher; and construction of a new shed for garden tools All of the work was done with a careful eye to maintaining or restoring the original character of the house. Available for Rental: Memorial Day - Columbus Day; Weekly rentals (7 night minimum); Sunday - Sunday. Waterfront. 8500 sq foot grand estate home located on impressive 12.3 acres of rocky shorefrontage. Exquisite home with ample space, soaring ceilings, quality features, decks, gardens and much more, all in an unsurpassed setting. Home is available for events, email or call to inquire. Link here for Virtual Tour: http://www.visualtour.com/show.asp?t=3028170&prt=10003 Ocean Garden Estate is a grand property in a stunning setting on Penobscot Bay, overlooking the hills of Camden. It boasts 8,500 sq feet of incredible living space, 440 feet of waterfront, and 12 acres of professional gardens, lawns and woods. Inside, large rooms, soaring ceilings, sky lights and open water views give a majestic feel. There is ample space for larger families and groups to relax, gather and entertain. The living room enjoys a curved, stone fireplace, along with a bar with ice maker, refrigerator and tub for ice and drinks. There is an additional smaller bar in the upstairs game room with 2 gaming computers, full size pool table, ping pong table, card table, and Nordic Track. A sunroom offers even more space to spread out, and has AC. A professional, gourmet kitchen has every amenity that you can possibly think of, including a baking station. There is a separate, formal dining room. When it is time to rest, there is ample sleeping space with 6 bedrooms and 5 and a half baths. The master bedroom is on the main floor, with stone fireplace, private bath en suite and AC. The remaining 5 bedrooms and 3 baths on 2nd floor, and include a secondary living area. Ceiling fans are in every room. 3 TV's have Direct TV, other TV's have DVD players. There is ample porch and deck space, where rear waterside porch faces west enjoying spectacular sunsets. There is a large, outdoor grilling area with both gas and charcoal grills, with granite serving spaces. The grounds offer an expansive walking garden running adjacent to the Bay, professionally designed to be a continuous blooming experience. So beautiful, it was featured in the Brooksville Garden Tour. There is a mix of seating among the gardens, as well as wishing well and other adornments adding to the beauty. The house has an elevated perch overlooking Penobscot Bay, offering fabulous views of the hills of Camden and the island of Islesboro. Large sailing Clippers are a common sight all summer. A private beach is available on property during low tides. Additionally, Bakeman's Beach is nearby to harvest your own mussels for dinner, easily launch your own kayak or small boat, or enjoy a public beach experience. The spaciousness and grandeur of this property makes it perfect for large families, reunions, weddings, and other events. Rates subject to change. Click "Book it Now" for rates and availability. Our cottage sits on a small bluff directly overlooking Penobscot Bay. 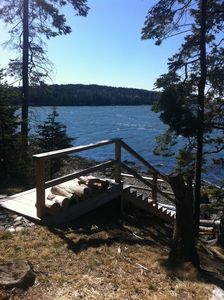 About 15 feet from the cottage deck is our private stairs, leading to the water's edge. Maine's coastline is more rocky than sandy -- our "beach" is perfect for rock scrambling. And there is a little dock at the foot of the stairs where some guests take their morning coffee or store a kayak or just sit and think. The water is cold for swimming, but is ideal for rowing and canoeing and kayaking if one isn't hardy enough to take a swim There are little islands nearby to explore, but my favorite thing to do is to paddle out into the bay and sit quietly until the golden seals pop up around me. We rent the cottage by the week, or multiple weeks. Our weeks run from Saturday to Saturday. The cottage is fully furnished with linens, towels, cookware, dishware, and glassware. It is cleaned and the laundry is done before each guest arrives. There’s a nice-sized master bedroom with a queen-sized bed. In the dining/living greatroom there’s a daybed/sofa with a trundle, which becomes two twin beds. That room is quite attractive, I think: it has a cathedral ceiling and along one wall is the brick fireplace, while one entire other wall is windowed to look out across the water. Also, there are two charming, cozy sleeping lofts -- one of them looks across the bay and the other looks west, across a field. Each of these lofts has access via pulldown stairs. The lofts were designed for the children of the family that originally built the cottage -- they are fun and sweet and, oddly enough, pretty darned comfortable (which I know from sleeping in them quite often as an adult!). They each have futons and a little table with a little lamp on it. There is only one bathroom. It has been entirely renovated and expanded in 2019. It has a shower stall. The cottage kitchen isn’t large enough to eat in, but it’s not small, and the appliances are in good working order. There’s an electric stove, a microwave oven, a normal-sized refrigerator, as well as various kinds of coffee makers and a toaster oven. There are no laundry facilities in the cottage, but there is a laundromat in Castine, and another one in Bucksport. All well-behaved pets are welcome at our cottage. 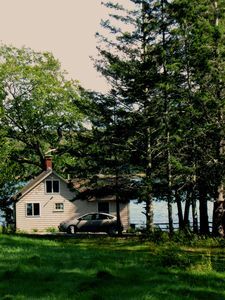 Guaranteed loon sightings at this quiet, private, well-appointed, lakefront cottage just minutes from the coast of Maine, Camden, Belfast, Rockport, and Rockland. Swim or fish in the pristine waters from your private floating dock, or enjoy the abundant aquatic wildlife, and natural shoreline in kayaks or canoe. Watch loon families casually swim along the shoreline as you enjoy your morning tea or coffee just steps away on the spacious deck overlooking the sparkling lake, or just sit quietly at the kitchen table and watch the sun rise over picturesque Hobbs Pond. Explore nearby Camden Harbor, or travel the endless miles of Maine coastline. Hike in Camden Hills State Park, or drive up Mount Battie to experience breathtaking views of inland lakes, the islands of Penobscot Bay, and scenic rocky coast. Go for a sail on a historic windjammer, or pack a picnic lunch and discover the rocky shore at Beauchamp Point. Tour the Owls Head Transportation Museum or visit numerous art galleries, including the world class Farnsworth Museum in Rockland featuring their renowned Wyeth Collection. 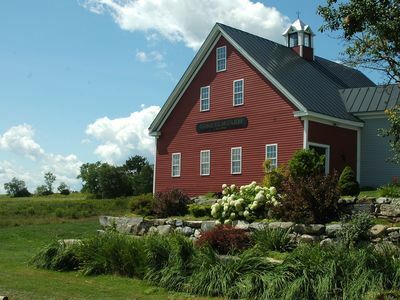 Visit Cellardoor Winery (mainewine.org) in nearby Lincolnville to wander the vineyard and sample their excellent wares. 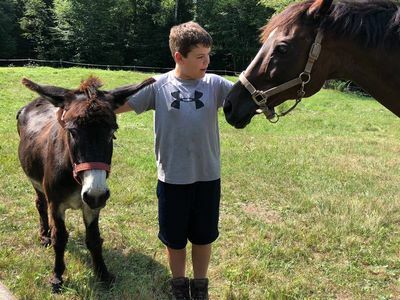 While at Hobbs Pond, visit the quaint village at Hope Corner which features an authentic, modern-day blacksmith shop, jewelry gallery, art center and True Park. Have lunch at Hope General Store, where you can get delicious sandwiches and pizzas, all your cottage provisions, as well as an impressive selection of imported and domestic beers and wines. Later, you can enjoy a casual dinner at Hatchet Mountain Publick House and Antique Gallery, all located just one mile from Lazy Loon. At days end, relax before our beautiful fieldstone fireplace and allow yourself to be entranced by the peaceful night sounds and hypnotic call of the loon. Consider a visit in September or October and enjoy a front row seat to our spectacular foliage. Enjoy our scenery, our people, our beauty, and our heritage. We are Maine. Join us for a week or two and see what all the fuss is about!! The Barnacle is in a peaceful location very near a salt water cove and salt water pond, with a reversing falls in between. It is only a short walk to a state sanctuary with hiking trails.Various programs are provided there throughout the summer months to help visitors better understand the wonderful natural area. Harborside is a good biking and kayaking area, too. 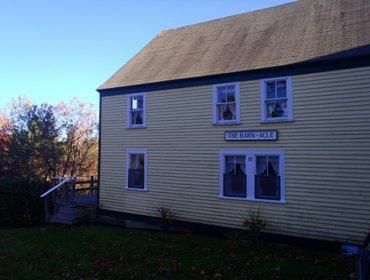 SUNDAY-SUNDAY RENTAL The Barnacle is in a peaceful location very near a salt water cove and salt water pond, with a reversing falls in between. It is only a short walk to a state sanctuary with hiking trails and where various programs are provided throughout the summer months to help visitors better understand the wonderful natural area. Harborside is a good biking and kayaking area, too. The property has a living room, kitchen, small library and three bedrooms (1 queen bedroom and 2 bedrooms each with a twin bed). There is a deck with awning where one can enjoy morning coffee or a meal while watching the many birds that like the gentle stream near the deck. If the weather is good, there could be a boat ride across the harbor to Castine on the owners' boat. Rates subject to change. Click "Book it Now" for rates and availability. Chez Seeger, first floor Belfast apartment is open and roomy, great for family get-togethers or couples traveling together. Perfectly located, just a short walk to the shore, Belfast City Park, or Main Street, filled with lovely shops, wonderful restaurants and galleries. Spend time in Belfast Harbor watching lobster boats, vintage schooners and cruise ships. It's just a short walk to the Saturday Farmers Market for fresh local goodies. Belfast is also a great home-base for day trips to Acadia. The living room is open to the large, country kitchen with cathedral ceiling and skylights. Great space for family get-togethers or couples traveling together. Enjoy watching movies on the 55" 4K TV or unplug and go "old-school" with board games, fun for every age. Two bedrooms offer cheerful linens and comfy beds, another pass-through room, with twin-size day bed, could be used as a sleeping space or sitting room for the master bedroom. Large bathroom with plush, cotton towels, includes a washer and dryer. The backyard has peach trees, and a raised bed veggie garden. There's a sitting area and fire pit, perfect for roasting marshmallows. Take a walk to the shore, beach towels and sand toys are provided. 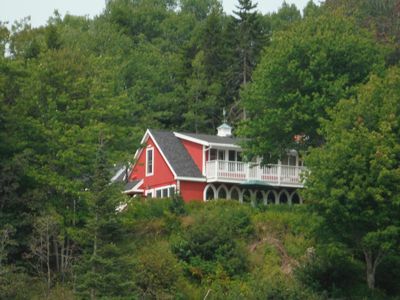 Solsidan is a traditional-style Maine beachfront cottage. The setting, nestled on a quiet point with pebbly/sandy beach front and back, is truly spectacular. The cottage has a magnificent view across Penobscot Bay to Cape Rosier and Castine and beyond to Blue Hill. You can step off the porch and walk the beach with your morning coffee. The beach is regarded as one of the best on the island. 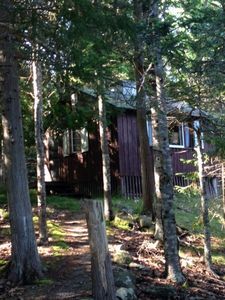 The cove has a small number of original summer cottages. Enjoy quiet walks, boating, reading, and relaxation. Dine on the covered porch and enjoy the view. Some changes have taken place during its life but Solsidan retains the original wood open-wall construction. 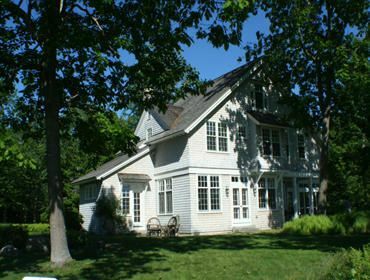 The house has a spirit that conjures up images of the summer-long family sojourns that have occurred many summers during the last 100 years of the cottage's history. Water on two sides. : See the view of the back beach while preparing dinner in the kitchen! Narrative description: Solsidan has 3 bedrooms, one on the first floor (queen bed), and two on the second floor. There is also a large open room (studio) overlooking the bay that has two twin beds. The first floor has a bedroom, kitchen, living room with woodstove (wood provided), spacious bathroom (recently redone), laundry space, and glassed-in porch sitting/dining area. There is also an outdoor shower area. One full side of the house overlooking the water is a covered porch, with plenty of room to spread out in the separate dining and sitting areas. The house is fully equipped with bed linens, towels, pots, pans, and bakeware, dishes, coffee grinder and maker, lobster pot, toaster oven, charcoal grill, radio, CD/iPod player, books, puzzles, and games. 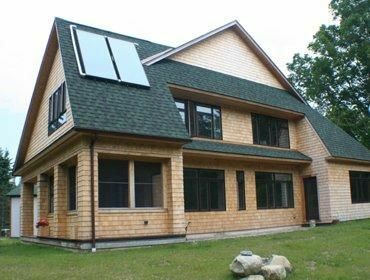 Newly constructed off-grid solar home,green living, spacious & open design, large kitchen, Quiet, secluded, peaceful 25 acres. Private beach on property, ~300' from house. Beautiful area on Downeast ME coast. Canoe and a rowboat available for renter use. Towels & linens provided. 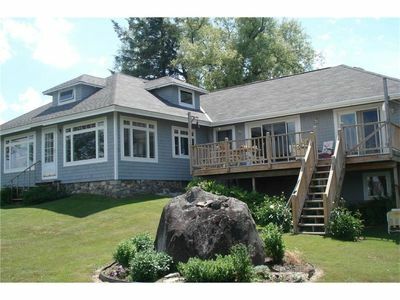 Cedar shingled home, 2 floors, 2 full baths & outside shower. 1st floor: large well equipped kitchen with breakfast nook, open dining & ample LR area, large DR table, study/library room, 1 full bath, screened-in insect resistant porch with 2 chairs , table, loveseat. 2nd floor: spacious master BR with queen bed, 1 guest BR has a daybed with trundle (2 twins) which can be made up into a King size bed,2nd guest BR has a double bed. Also LR couch pulls out to a QN size bed for extra sleeping space. Rates subject to change. Click "Book it Now" for rates and availability. Pausa Lekua( Basque for "heart's rest) has great beach frontage and comfortable accommodations. A wonderful spot to spend your summer holiday or a long weekend. This five bedroom cottage has everything to make your stay memorable. 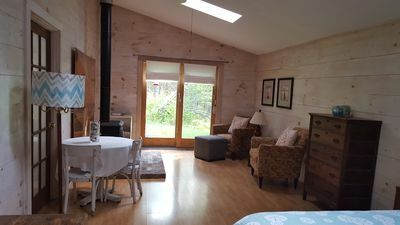 A place to experience the peace and quiet of Maine, yet a great launch pad to explore Acadia National Park/Bar Harbor, Camden/Rockport, Rockland and Belfast. After a day of exploration, come back and relax with a gentle sea breeze on the deck or the warmth of the stone fireplace should the weather turn. Enjoy the rustic charm of an original 1800s Bayside gingerbread cottage! Savor the view from the front porch, relax with a good book, or chat with neighbors as they stroll by -- this is a friendly summer community! Dyer Cottage sleeps six in three bedrooms (one queen, one double and a set of twins) and one bath. We furnish bed linens, but you should plan to bring your own towels. Porch furniture, charcoal grill and picnic table provided. Email or call for availability, June through Labor Day. Visible from the front porch, the water's edge is just a block away -- as is the Village Center, a family-friendly focal point for summer fun. Children frolic on the playground swings, while older kids play pick-up games on the basketball court. At the Village pier and float, children of all ages splash in the bay under the careful watch of a lifeguard. Youngsters can learn to sail in classes offered through the Village Yacht Club. Rental kayaks are available nearby, and can be beached here. Many summer residents are sailors, and their moored boats dot the Bayside shoreline. Northport Golf Club is just a few blocks away and welcomes visitors. Historic Bayside: Established as a Wesleyan summer camp meeting community in the 1800s, Bayside's original homes -- tents on wooden platforms -- were subsequently transformed into Victorian gingerbread cottages that now are gaily painted in a variety of hues. The village comes to life during the summer season, with American flags flying, colorful flowers overflowing their planter boxes, cats snoozing in the sun, residents rocking on their front porches, and friendly folks strolling the streets and socializing along the way. Nearby Attractions: From Bayside, it's just a short drive to Lincolnville Beach, where the ferry leaves for Islesboro. A few miles farther down are hiking trails in the Camden Hills (Mt. Battie), and the beautiful town and harbor of Camden. The Farnsworth Museum, famous for its Wyeth collection and more, is situated not far beyond Camden in Rockland, another seaport, which offers day cruises and overnight windjammer sails. A little farther down the coast you can cruise to Puffin Island, where the birds were reintroduced successfully in the 1980s, or visit a botanical garden in Boothbay Harbor. In the opposite direction, you can head into picturesque Belfast with its new shipbuilding facility and small working harbor. In Searsport, don't miss the Penobscot Marine Museum with its historical perspective on the area's seafaring days. Farther East are the Penobscot Narrows Bridge and Observatory, and historic Fort Knox. On up the coast are spectacular Acadia National Park (not to be missed!) and the towns of Bar Harbor, Northeast Harbor, Seal Harbor and Southwest Harbor on Mount Desert Island. There you can go sightseeing, whale-watching, island-hopping, and more. En route you'll pass a water park in Ellsworth, mini-golf, and other attractions. Antiques shops, art galleries and restaurants abound throughout the Midcoast Region. Countless families make Bayside their annual vacation destination throughout their children's growing up years -- and beyond. Kids who come for successive summers establish lifelong friendships. two-bedroom housekeeping cottages fully equipped with fine water views and a short walk to the shorefront below offering deck and dock. Castine, Maine has to be seen to realize what a gem you have found. A beautiful seaside town with a deep historical past where many revolution battles were fought. Within one hour of scenic Bar Harbor, Acadia National Park, Camden, Bangor International Airport, home of the Maine Maritime Academy, Castine has great accessibility. Castine offers several restaurants as well as many local points of interest, a salt water swimming pool, public beach, and Dyces Head light house, a few of the places that you just shouldn’t miss. If you are looking for peace and quiet, but close enough to all amenities, then this is the place for you. 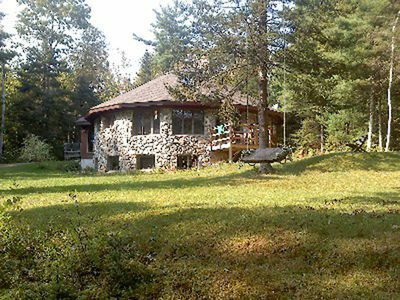 This wonderful, modern year round cottage offers everything you would need for a family vacation. Don't settle for an "old in the tooth" property! 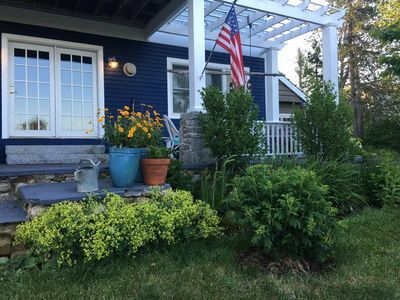 You are in the heart of the most prime vacation region of Maine - located by beautiful Pitcher Pond, and minutes from the Atlantic Ocean, Camden, Rockport, and Belfast - you have access to boating, fishing, hiking, or just lounging around. Just a quick bike ride, or nice hike, and you are at one of the best organic farms in the area - just buy from the roadside stand. The cottage is turn key. Just bring some food…and all the rest is there waiting for you - including the bar-b-q! A spacious kitchen, large sitting room, and a huge deck awaits you. There are 2 bedrooms - one with an ensuite bathroom. There is also a 2nd full bathroom as well. Appliances include modern fridge, stove, microwave, toaster oven, coffee makers, washing machine and dryer. The property is located on 3 beautiful acres! You can easily sleep 6 in the two double beds and the sofa bed in the living room. I also provide a queen sized air mattress as well. There is a flat screen TV with Direct TV for your use, plus internet service with wireless service. All of the amenities of home, but in this beautiful and tranquil setting. This is also a wonderful winter getaway. The property is fully heated and has a wood burning stove as well!!! Please note that the cottage is not waterfront property, although it is only 400 ft. from the lake. We do have a deeded access (our land) to the water just 1 minute away which is there for your use - albeit access with no dock. Public access to the public beach is only a few minutes away as well as a public boat launch. Also, for liability reasons there are no canoes or kayaks that come with the property, but are easily and cheaply rented. My home is close to Lincolnville Beach, Ducktrap River, Camden Harbor, Belfast Harbor, Megunticook Lake, located midcoast for easy day trips to Portland, Bar Harbor, Blue Hill, many festivals and fabulous restaurants and shopping. There are schooner trips from Camden Harbor, boat trips from Belfast, local fishing. and about 2 miles from Lincolnville Beach...a sweet, small beach town. I serve coffee in the morning, . Note: I have a two day minimum reservation and a 5 night maximum reservation. The guest studio, as pictured, is the rental the whole home. However, I do occasionally rent out my whole home in summer for $1200 a eek to guests who seem a great fit. Comfortable, two story, fully furnished home in Belfast. Situated on a very spacious lot,beautifully landscaped with numerous gardens and trees. Large deck overlooking beautiful Belfast harbor. Propane fireplace in living room, Bedroom #1 has a queen bed, bedroom #2 has twin beds and there is a queen size pullout couch in den. Dishwasher, microwave, washer, dryer, cable T.V. ,wireless Internet service,5 min. walk to downtown Belfast. Also available is a one bedroom apartment in adjacent building, please email for availability. Payment by check only. $100.00 deposit required for reservation. Please contact me to make reservations and payment arrangements. 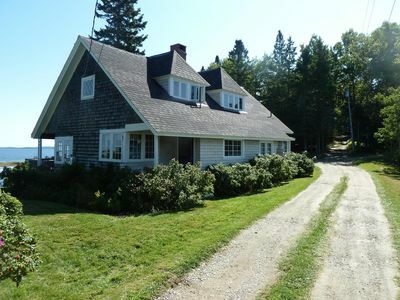 1849 Farm House on 40+ acres with panoramic views of Midcoast Maine. Fully restored in 2002. Watch the sun rise and set daily from our hill top. Road dead ends at Frye Mountain Game Management area (5,240 ac). Access to ITS snow mobile and ATV trail across the street. Enjoy the quiet of the farm, or take a 10 minute drive to Belfast Maine or 30 min drive to Camden Maine. Acadia National Park is about 60 miles away. First floor has open farm house kitchen (dishwasher, stove/oven, Keurig, microwave, refrigerator/freezer) Kitchen opens up to deck with views of mountains. Dining room opens to kitchen Formal parlor and family room First floor full bath First floor bedroom with twin bed. Outside charcoal Weber grill. Wood stoves in dining room and kitchen. Second floor has full bath, laundry room, and 4 bedrooms. Two bedrooms have full beds. The other two bedrooms have queen size beds with twin bed in one room. Towels and sheets provided. This is a NON SMOKING property. Children must be well supervised. We begin to take reservations for 2019 on January 1st. TOP TEN REASONS TO STAY AT FIREFLY COTTAGE 1. Our charming cottage sits 100 feet from the shore of Hobbs Pond in a quiet, private setting under beautiful trees. 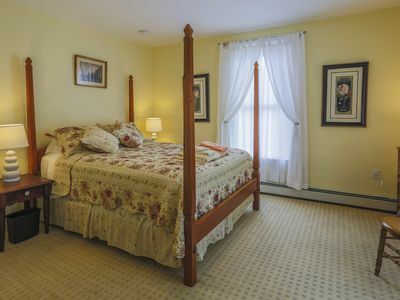 It sleeps four very comfortably in two bedrooms with pine floors, one with a queen bed and the other with two twin beds. Full bathroom with shower/tub. Well equipped kitchen. Attractively decorated with braided rugs and comfortable furnishings. WiFi, flat screen TV with DVD player, board games, DVDs, books, two decks, one with gas grill and picnic table and the other next to the lake, kid friendly. Hammock to take a nap in. Quality bed linens are provided on the beds. The seaside town of Camden is just a 10 minute drive away. 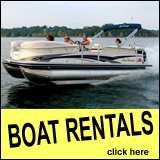 Rentals run weekly, Saturday to Saturday in July and August. Two night minimum stay in June, Sept and October. Firefly Cottage is the BEST value on Hobbs Pond and especially in the surrounding area. 2. A peaceful, pristine, spring fed lake is right at your door step! Offering great swimming and fishing plus two kayaks, a dock and a swim float. Our lake side deck is a great place to sit and enjoy the sound of the loons or the pretty views of our coastal mountains. A small firepit to roast marshmallows sits next to the deck. Steps lead down into the lake for easy access. 3. We may be a small town but our area is resplendent with cultural attractions. Museums, art galleries, music festivals, Lobster Festival, film festival, wineries, antique stores and shows/music/movies at the Camden Opera House and Strand Theater are just a fraction of the things to do here. 4. The Great Outdoors: This is where the mountains meet the sea and we have many hiking trails for all abilities that allow you to see it all. Follow the trails in Camden Hills State Park, Coastal Mountain Land Trust and Georges River Land Trust. You can also rent bikes to cruise our local back roads. 5. Our area is a Foodies Paradise. 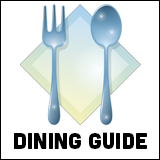 Camden, Rockport and Rockland are home to many fine, great restaurants of all kinds. Cooking classes are also offered locally. Hope has it's own pub (Hatchet Mountain Public House) where the locals unwind with a mug a beer. Many restaurants have outdoor seating in the summer, some with tables right on Camden Harbor. 6. Speaking of Camden Harbor, our harbor hosts a hub of activities including sailing, kayaking, paddleboarding and sightseeing. Take a two hour cruise on an historical schooner such as the Appledore or Olad. We delight in the vast array of tall masted ships that sail through our waters. 7. Lobster! Maine's iconic food can be enjoyed in so many ways. From lobster roll shacks to gourmet preparations, you'll find plenty of ways to scratch your lobster itch at our local restaurants. The Maine Lobster Festival is held in early August. Firefly Cottage is also equipped with a lobster pot so that you can cook your own. 8. Gateway to Downeast: We are centrally located on Maine's midcoast making us an ideal launching point for explorations to Acadia National Park, Coastal Maine Botanical Gardens, lighthouses, beaches, Fort Knox (bring your flashlights) and many other fun places to explore. 9. The People: Our area's rare beauty is paralleled by its sense of place. Perhaps it's due to our cold Maine winters when we all look after each other, but the people who call our area home are some of the most friendly, ruggedly refined folks you will ever meet. You will be welcomed with open arms. 10. 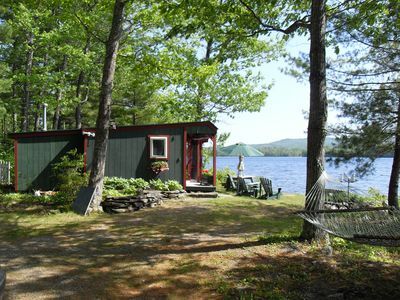 Firefly Cottage is THE best value on Hobbs Pond and especially in our surrounding area. We want you to have an affordable vacation while still experiencing an attractive, comfortable and clean place to stay while you are visiting. The cottage is close enough to the owners' home (2 miles) that we can be of assistance to our guests if needed, while still offering you privacy. We truly live in an authentically quaint and charming community. We take pride in our community and it's surroundings and hope that is reflected in everything we do. Unplug, unwind and enjoy your family and friends in a place you will want to return to again and again. FIREFLY COTTAGE IS A SMOKE FREE HOME. NO PETS, PLEASE. MAXIMUM OCCUPANCY IS 4 GUESTS. ALL BED LINENS ARE PROVIDED. DUE TO THEFT, WE ASK THAT YOU BRING YOUR OWN TOWELS. 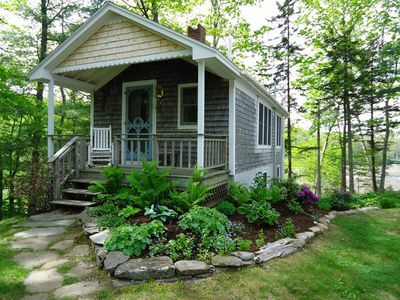 LARGE Coastal Cottage w/Tiny House and Ocean Views, Privacy, Silence. Everything is new or recently remodeled (2009)- Kitchen, Baths, Bedrooms, Hardwood floors, Tiny House (2018) for quiet reflection, meditation or reading). This is a comfortable cottage not luxurious. By 'comfortable' I mean well-appointed, attractive, easy furnishings but not priceless family heirlooms. It does possess Angela Adams wool rugs, Nate Deyesso custom furniture, original art by recognized Maine artists, and authentic nautical motifs throughout - some salvaged from the training ship of Maine Maritime Academy. Simple and neat. Property is 250 yards from nearby Witherle Woods Wilderness Preserve- 155 acres overlooking 100' bluff providing unobstructed views of Penobscot Bay: Get lost for 1-3 hours, discover abundance of Osprey, Eagle, Raccoon, and Deer. In fact, 38 bird species call this home! Four decks provide ample space for relax and recreation: grillin, chillin, and millin. 4.5 baths ensure you do not wait. Minutes to the fine restaurants of downtown or Back-shore for swimming and cook-outs. Ideal for Large family retreat or two-family getaway! Bedrooms: Four Queens, three twins, and another Full size bed in tiny-house guest cottage! Newly constructed solar home (with quiet and seamless backup power) on the ME coast. 25 acres, secluded, peaceful wildlife area. House is 300' away from private pebble beach on property. Upstairs:3 BR & 1 full bath, 1st floor has bedroom (with twin bed) well-equipped kitchen with breakfast nook, screened porch, open 'great room' with sleeper sofa, couch, large dining table, DIRECTV, HDTV. Sattelite WiFi, high thread count sheets. Gourmet kitchen has everything a cook needs. Microwave, frig, toaster, gas range, blender, french press for coffee, lobster pot. Dinnerware, flatware, kitchen towels, pots & pans provided. Gas grill outdoors. Trail on property to shore, picnic table & fire pit above beach, area to tent on.. We have a basketball hoop, Foosball table & ping-pong table in garage for rainy day activities, also cards, a cribbage board, checkers, dominos, board games. DVDs, books for kids & adults, some children's toys, nature guides. For little ones we have a 'pack & play', a couple of baby gates, outlet covers, beach toys & some toys to keep them busy! Fully furnished 3 bedroom Lake side cottage. Enjoy beautiful summer sunrises. The space Our beautiful home is extremely fortunate to be one of the closest airbnbs to Belfast's downtown. You can leave your space, and in five minutes, be shown a table at a local restaurant, or be purchasing a ticket at the Colonial Theater. When you're tired after a day's activity, your bed is just a short walk up from the harbor and downtown. Guest access While Mariann and I hope that we've made your private space comfortable, we extend an invitation to relax in our library, dining room, sitting room, or on one of our front porches. The home's front door is open and unlocked until 10:00pm each day. Interaction with guests While we respect the privacy and wishes of our guests, Mariann and I are available to sit down and discuss recommendations, destinations, and tips for making the most of your trip. The neighborhood Our home is located in Belfast's downtown historic neighborhood. The streets are filled with lovingly cared for homes, many of which were built for sea captains and early entrepreneurs. Visitors can easily walk to everything that downtown offers. We also have the Public Library, Congregational Church, Roman Catholic Church, Episcopal Church, Baptist Church, and Universalist Unitarian as close as two properties away. The Methodist Church is just a 5 minute drive across the bridge. Getting around You don't need to worry about finding a place to park your car as you enjoy Belfast, just leave it home and stroll around. Family Fun At 931 Castine Rd! This 4 bedroom house sleeps 8 comfortably. There are 4 bedrooms, 2 bathrooms and a large kitchen and living area upstairs. Downstairs is a lounge area and 2 bedrooms. Outside is a spacious deck and lawn area for games as well as a fire pit. 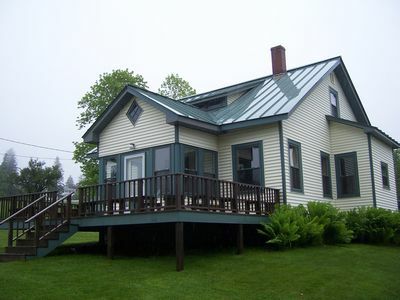 This house is located 5 miles from the Backshore Beach and 6 miles from downtown Castine and Maine Maritime Academy. It is a great house for families or groups of friends. It is about a 45 minute drive south to Belfast and a 45 minute drive north to Bar Harbor and Acadia National Park. 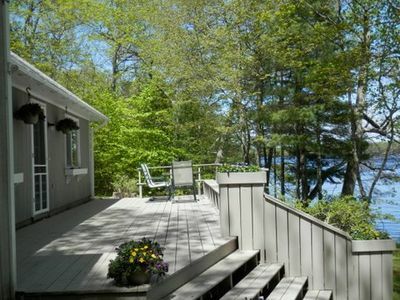 Enjoy beautiful views of Fernald's neck nature preserve and direct water access to Megunticook lake at this quiet 2 bedroom 1 bathroom lakefront cottage. 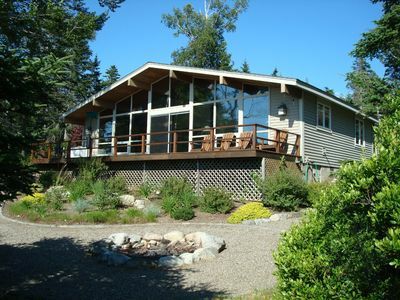 Conveniently located in Camden just 5 minute drive to town and the coast of Maine. 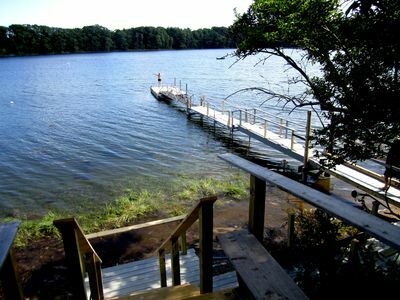 Enjoy swimming and fishing from private lakeside dock or hiking in the nearby trails in Camden Hills State Park. There is a queen size bed in the master bedroom and twin bunk beds in the second bedroom. In addition there is a finished basement with a pull out couch and sitting area as well as a washer and dryer. The kitchen if fully equipped with refrigerator, electric stove, coffee maker, microwave, dishwasher and toaster. WiFi and cable TV are included in the rental. On the patio there is a gas grill and picnic table for lakeside barbecues. This newly renovated, oceanfront cottage has spectacular sunsets and wonderful views of Stockton Harbor. The water-facing deck provides ample opportunity for grilling, relaxing, and watching boats, gulls, ospreys and eagles. It is a quiet and peaceful spot on the beautiful Maine coast. All rooms are newly renovated, comfy and attractive. The dining area with its water views is perfect for morning coffee and evening sunsets. It has a full kitchen. We are excited to offer this first year rental! Just imagine: Stockton Harbor with sail and lobster boats, Sandy Point with its beach and hiking trails, and Fort Point State Park with lighthouse, picnic area and trails - all within a five minute drive! There are plenty of opportunities for day trips: Beautiful Acadia National Park is only one hour away. One can enjoy gorgeous views from Cadillac Mountain, quaint shops and restaurants in Bar Harbor, lots of hiking trails, unique Sand Beach made up of crushed seashells, and a whale watch. Belfast, Camden, and Rockport are all within easy driving distance. Our cottage has all the comforts of home, including linens, towels, TV, internet, grill, and washer/dryer. This cottage may also be rented in the winter anywhere from one week to three months. Any rentals longer than 29 days are not subject to the 9% lodging tax. 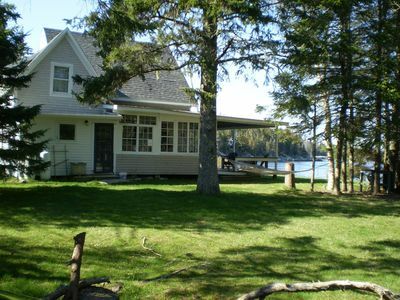 Our private cottage sits on Swan Lake's quiet north shore, near Swan Lake State Park. We are part of the Belfast coastal community, but sit peacefully apart, 15 minutes from town. Belfast offers dining, shopping and antiquing. We are within an 1.25 hours from Acadia and Bar Harbor. Our cottage has two bedrooms, one with double bed,and the other with a twin and a set of bunks. We have a fully appointed kitchen, air conditioning, ceiling fan and gas fireplace for cozy evenings. You will have a swim float, a canoe and a tandem kayak and propane grill. There is a large flat screen TV with Direct TV and internet service, including streaming. Relax on our dock or our deck up above. You can expect to see bald eagles and loons, while you swim or fish on our pristine lake. Enjoy the stargazing! We welcome canine guests with their well behaved owners! New on the market is a beautifully decorated first floor and second floor ANNEX. The Annex is part of a residential house where the owner resides. You can relax in the Annexes comfy first floor living room looking out at the blue waters through large French doors. The living room seats five comfortably and there is a flat screen TV with cable and Wii Fi available for your use. The first and second story bedrooms both have queen size beds. There is also a three piece bathroom and a kitchenette on the first floor as well. The kitchenette is equipped with a coffee/tea Keurig pot, microwave, toaster oven, refrigerator and freezer along with dinnerware, silverware, coffee, tea and treats. The first floor bathroom is equipped with bath and beach towels, as well as, soaps, shampoos and other toiletries you may need. The second bedroom and living area is on the second floor. The second floor not only has the second bedroom but also an additional living room to relax in as well. There is a sofa, accent chair and bean bags to sit back and watch Cable TV or use Wii Fi. There are chest of drawers available in both bedrooms and a first floor closet for hanging garments. Private steps to a sandy beach and lawn chairs are available for you to enjoy while staying at 18 Bayview Drive. 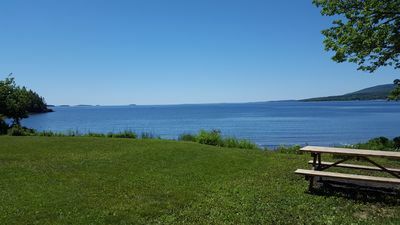 Perfect family get away, wonderful view of Penobscot Bay, sleeps 8. Baycrest Cottage is tucked in amongst the evergreens, oaks and birches, and yet has a wonderful open view of Penobscot Bay. One of our guests commented, "... waiting for the lobster boats in the morning, exploring tidal pools at low tide, BBQ's, and stargazing at night! 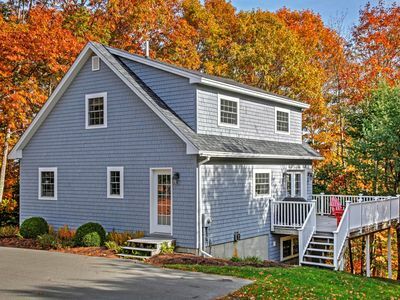 Your home is a wonderful place to relax and enjoy all that Maine offers." 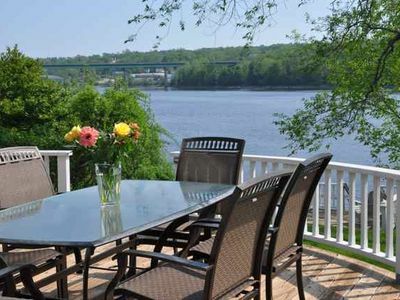 Read on to see how Baycrest Cottage could be just right for your family vacation in Maine. On the first floor our cottage includes: an inviting living room with wood burning fireplace, a beautiful newly-renovated kitchen with a spacious dining area, and a newly-renovated full bath. Upstairs are two bedrooms and a bunk room, all under open eves. The first bedroom has two twin beds that can be put together as a king-sized bed at your request. The second bedroom has a queen-sized bed. The bunk room includes 2 bunk beds and a beautiful view from the adjacent balcony. Our cottage is a cozy and comfortable place to get away from it all, yet it has all the amenities. A fully-equipped kitchen: from coffee maker to lobster pot and everything in-between will make you feel right at home. Other amenities include: DirectTV, internet connection, stereo, washer and drier, an outdoor gas grill, and an outdoor shower. 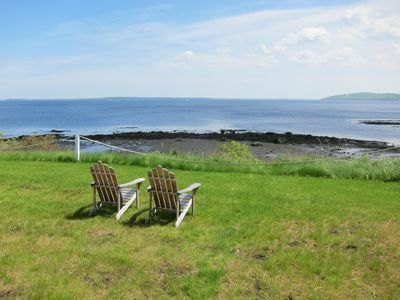 Enjoy the view of the Penobscot Bay from the double hammock or the Adirondack chairs. A short walk down the wooded path will bring you to a private beach. Also on our property is a CedarWorks play set - perfect for young guests. Feel free to enjoy the board games, puzzles, and the many books for children and adults while visiting Baycrest Cottage. Stockton Harbor, with public boat access, is just five minutes from the cottage. Twenty minutes away is the nearby town of Belfast which offers a variety of shops, restaurants, a movie theater and even a few art galleries. An easy day trip from Baycrest Cottage could include Acadia National Park or Bar Harbor for more shopping or whale watching. The popular town of Camden is less than one hour away. 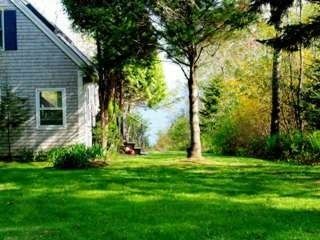 Baycrest Cottage is a wonderful home away from home for your family's Maine vacation - "The Way Life Should Be." 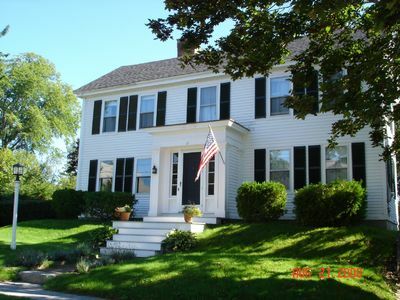 Classic In-Town Sea Captain's Home - Great Fall Escape too! The prettiest town on the coast of Maine, with lots of history, as well as beach, golf and tennis. This classic sea captain's home, built in 1823, has been lovingly cared for and renovated to accomodate up to ten people. You will be very comfortable here, whether sitting on the screened porch or sitting by the fire in the family room. 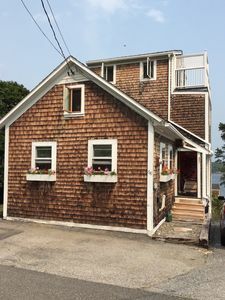 The house is one and a half blocks from the ocean and the town dock, near restaurants and shops. It has a large fenced yard, a modern eat-in kitchen, large bedrooms, formal living room and dining room, family room, and a wonderful screened porch. Within two blocks are the golf course and the tennis courts, which welcome visitors for modest fees. Castine is a special town for those who love history and the sea. Our historical society is open daily with fresh exhibits about the early sailing days on the Maine coast, as well as exhibits of famous writers and artists that made Castine the place to come for summer inspiration. You can get just about everywhere on foot or bike, leaving the car parked until you want to explore Acadia National Park and other inviting small towns on the coast. Kayak rental and tours are also available at the town dock, along with ice cream and lobster rolls! Come here to smell the sea and relax in a beautiful setting that takes you back to simpler times. Ferry away from your hectic life. Rejuvenate and decompress at Crow's Nest Cottage, on Islesboro Island, in Midcoast Maine. 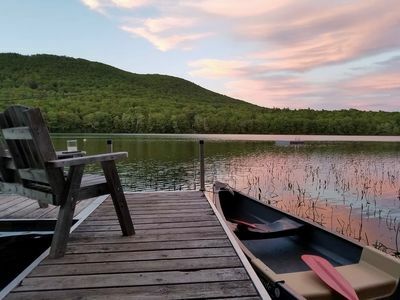 Reconnect with your partner and your family in this incredible get-away-from-it-all place 20 minutes by public State of Maine ferry off the Maine coast. 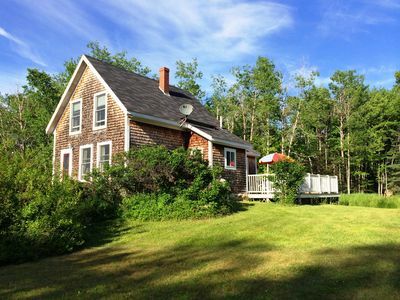 Reserve a summer week now - - or two or even three weeks - - at our cozy, comfortable, very clean, cottage on magical Islesboro Island. The sooner you reserve, the more likely you are to get your preferred week. Crow's Nest is a GREAT VALUE FOR A FABULOUS LOCATION! We rent our cottage by the week (Saturday until Saturday) from the third week of June through the third week of September. The last two weeks in July and the first three weeks in August are the most desired. We have proudly shared Crow's Nest Cottage since 2006 with over one hundred families. 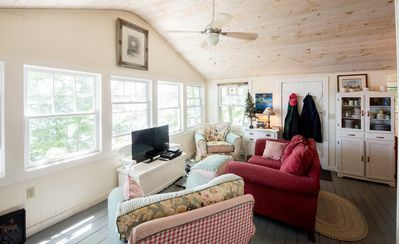 Their testimonials (see our own website maineislandhouserental) speak loudly about their wonderful memories of perfect vacations at Crow's Nest Cottage. These weeks ARE STILL AVAILABLE! June 29 (Saturday) – July 6 (Saturday) July 6 (Saturday ) – 13 (Saturday) July 13 (Saturday) – July 20 (Saturday) The MONTH OF SEPTEMBER IS STILL WIDE OPEN. September is also a fabulous time on Islesboro and rental rates are reduced to $900 per week. A happy guest said it best: "This week was exactly what we needed! This house is just perfect - -thank you for all the amazing touches that make it feel like home! Thank you for sharing your gorgeous home with us. This is a gem on the crown of an amazing secret of an island. We loved every minute!" This is a place that 'time forgot.' Think 19th century Vermont transported to an island in the ocean! The cottage has Internet any time you want to get back into the 21st century! 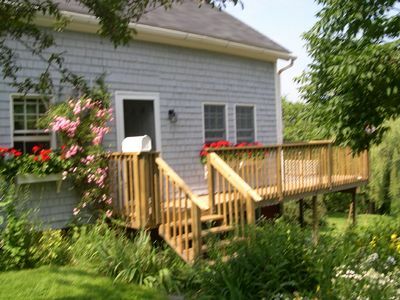 Crow's Nest cottage is an easy 20 minutes by ferry off the gorgeous Maine coast. 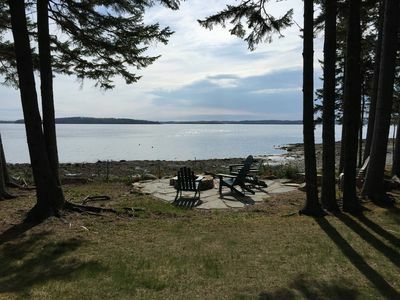 Fully renovated, Crow's Nest cottage is located at the northern, rural end of legendary Islesboro Island, considered by many the most beautiful of all Maine islands. The cottage faces the Meadow Pond, a quiet, lush wildlife refuge. It sleeps 4 comfortably in the 2 bedrooms; the living room has a Queen-size futon for a 5th adult or your teenager. We have a MAXIMUM limit of 5 people. Many quiet beaches are minutes away by car. The cottage has a marvelous, large deck. This is a SMOKE-FREE home. NO PETS PLEASE. The cottage's spacious, light-filled bathroom has an old-fashioned tub with hand-held shower unit. We do NOT have a conventional stand-up shower. Guests frequently tell us that Crow's Nest Cottage is like a home away from home. As one family said, "this is by far the best equipped rental house we have ever stayed in! The Peebles provided everything one could imagine needing!" Islesboro is a very quiet vacation spot. If you are looking for beauty and tranquility, for peace and quiet, and a "low-key" vacation spot, you'll love Islesboro Island and Crow's Nest Cottage.If you are looking for lots of restaurant options, movie theaters, amusement parks, bars, fast food, shopping, and crowds, Islesboro Island is NOT the place for you. Our Meadow Pond Neighborhood: Crows Nest cottage is located “up-island” and looks across to the 20 acre, fresh water, Meadow Pond, a neat wildlife refuge for deer, birds, ducks, turtles, beaver, etc. You need a car on the island to get to the 2 small grocery stores, to the 2 restaurants and ice cream parlor, for speedy trips to local beaches and public playground, and to get to the ferry. The island has hundreds of secluded and hidden coves and beaches. If you love the splendor of the Atlantic Ocean and wild Maine coast without droves of tourists, Islesboro is your place. There are dozens of secluded, beautiful coves and beaches -- both sandy and rocky -- within a 5 to 15 minute drive from the cottage. Or, pack a backpack and bike (or walk!!) to them....Explore them on foot or in a kayak. Pack picnic lunches and suppers and play Robinson Crusoe on your "private" island. One family happily emailed us: "What an amazing week we had! We spent countless hours walking on so many beaches! We collected so many shells and sea glass, they will be our priceless treasure forever - - so great!" VISIT OUR PERSONAL WEBSITE FOR DOZENS OF GUEST REVIEWS, BEGINNING IN 2006, AND MANY MORE PHOTOS & DETAILED INFORMATION RE THE COTTAGE AND ISLAND! The link to our website is at the bottom of the "Amenities" page. Please scroll down to the end to read more about our PAYMENT and CANCELLATION policies. We are now part of HomeAway's on-line booking and accept credit card payments. Although we do not supply bikes or kayaks, they are available for rent on the mainland from a variety of companies. Our "Frequently Asked Questions" (FAQ) on our personal website provides contact information for these rental places. FERRY TICKETS - ROUND-TRIP FARES (Effective May 21, 2018): $30 for vehicle and driver $11 for adult passenger $5.50 for child passenger Explore the nearby coast : The famous mid- coast Maine villages of Camden, Rockland and Belfast are minutes from where the Islesboro ferry lands, in Lincolnville. These villages have many shops, epic restaurants, great book stores, food stores, antique shops, public libraries, museums, and energetic waterfronts full of beautiful old and new boats. Schooners for day tripping are berthed in Camden Harbor. Drive a few minutes south from Camden to Rockland where you can spend several happy hours at the renowned Farnsworth Art Museum. The Farnsworth is home to the Wyeth Center, one of only two centers in the country dedicated to the three generations of Wyeths: N.C., Andrew, and James Wyeth. PAYMENT SCHEDULE: We are now part of HomeAway's on-line booking. 50% of your Rental Cost plus Refundable Security Deposit of $200.00 is DUE IMMEDIATELY. The balance of your total Rental Cost is due on or before 30 days before you check-in. CANCELLATION POLICY: Cancellations must be made by US mail or email and must be confirmed by Homeowner. If the Guest wishes to cancel his/her reservation, the deposit will be refunded as follows: •	100% if cancelled up to 60 days prior to the check-in date less $100.00 cancellation fee. •	50% if cancelled between 59 - 21 days prior to the check-in date less $100.00 cancellation fee. •	0 % if cancelled less than 21 days prior to the check-in date. If Homeowner can re-rent the cottage, Homeowner will return 50% of deposit less $100.00 cancellation fee. VACATION OR TRAVEL INSURANCE: We encourage Guests to purchase vacation or travel insurance in the event of a necessary cancellation or emergency. WINTER RENTAL: We are always looking for a terrific winter tenant for the whole winter season, mid-September through early June, but this may be negotiable. We may be amenable to renting for a shorter rental period, but we have to charge a considerably higher monthly rate for shorter winter rentals. 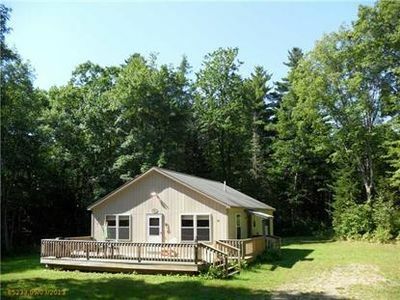 A post and beam style cottage on 1 acre of land on Levenseller Pond, 10 minutes from Camden in midcoast Maine. 3 bedrooms(2 with a queen bed and 1 with a double and a set of bunk beds), 2 bathrooms, one with a spa tub (40 jets) a loft, fully equipped kitchen, washer/dryer, a large deck and screened in porch make this the perfect vacation home. The cottage also has a finished basement with pool/ping pong table, bicycles This is our second home and we only rent it when we cannot use it. We run a bed and breakfast and the summer is our busy season, so you get to enjoy it. Call the Inn 2077634290 in you need shorter stay in off season. Surfside cottage sits just 100 feet from the high tide mark. This is rare along the coast and allows you to experience both the spectacular views of the ocean, and the sound of the coast. Relax to the sound of the surf, loons and harbor bell and watch lobster boats pass by. 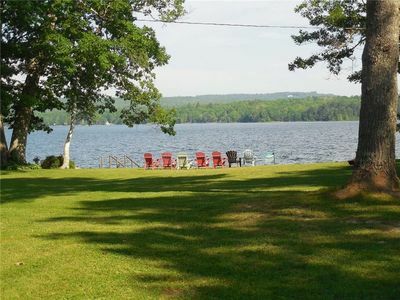 Plenty to do right at the cottage; spend the day on the beach, bring your kayaks and set out right from the beach, spend time with your kids in the playing field or sit and read a book on the patio or front room. Watch seals and loons from the cottage. Young's Lobster Pound for lobsters in the rough is 3 minutes away. It is also centrally located for day trips; 1 hour 15 minutes to Acadia National Park, 25 minutes to Camden, 40 minutes to Rockland, and 5 minutes to Belfast center. This adorable coastal cottage was rebuilt in 2010. Spectacular Waterfront Home on the Maine Coast! Enjoy morning coffee on two beautiful porches or a stone patio at water's edge in this four bedroom, three bath home. Master bedroom with private staircase and bath is a wonderful retreat for extended families. Sun room, living room and open kitchen/dining/living area gives everyone room to spread out. Private steps to a tidal beach. Five minute drive or fifteen minute bike ride to historic downtown Belfast. Great views for bird watching and of Belfast Bridge. Perfect for kayaking, swimming and fishing. Charming Belfast Cottage! Great Bay Views! Easy Walk to Town! This cottage has "feel good" bones!! Completely exhale the minute you step foot in the door of this 3 story home! Two bedrooms: one queen, one double. Additionally, a loft with a double mattress and twin pull out couch, plus a bonus "tower" room with one twin bed. One bath, full kitchen, large living room facing the bay, and dining area. Walk out basement and balconies facing the bay off the main floor, master bedroom, and "tower". Quiet residential neighborhood, only a 1/2 mile walk to restaurants, shops, food co op, galleries, and boatyard! Two minute walk to pebble beach! Gas grill, beach chairs, two kayaks. Spectacular sunrises, plentiful birds, star lit nights! Close to walking path along the Passagassawakeag River and bountiful farmer's markets! Please note that there are spiral stairs leading up to the master bedroom on the second floor, which are not suitable for children and may not be suitable for people who may have trouble navigating them. There are regular stairs leading to the "Cottage Room" in the basement. Also please note that the bathroom is on the main floor, not the same floor as the bedrooms. Expansive views down Penobscot Bay with beach. 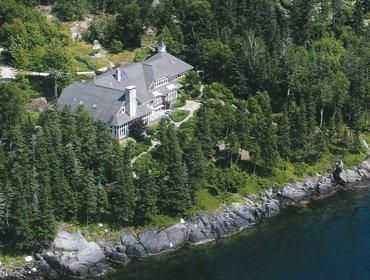 A truly remarkable location at the north end of Penobscot bay. This is our summer house, not a cheap rental. Private setting down a quaint dirt road. Pick fresh mussels on the beach at low tide. Enjoy seals, sailboats, our osprey family and views of islands from our deck. The beach at sunset is stunning. Cape Jellison is a very special place, a secret spot in the heart of Penobscot bay. Our roomy, spacious second-floor apartment is located in downtown Belfast; the harbor walk, galleries, shopping. This apartment lets you be a part of this pristine, picturesque ocean-side village. Go downstairs and there you are! Movie house, restaurants, boat rides, festivals, galleries, shops, music in the street. Enjoy the comforts of home, the views and the people. We welcome home couples, solo adventurers, business travelers, families (with kids). This beautiful space was lovingly put together using beautiful pieces of comfortable furniture, well curated art, gorgeous carpets, hand picked media (DVD, books, etc), interesting lamps, and heavenly linens. Nothing was spared to make this walk up apartment feel like a sanctuary for the traveler who truly wants a beautiful space while visiting our energetic and lovely small town. Two bedrooms, (1 Queen, 1 King and a day bed) sleeps 4-5, well equipped kitchen, bathroom, dining and living room. amenities include: pack n play, blow dryer, ironing board and iron, extra blankets, bedding and towels, coffee maker, microwave oven, fully capable cooking amenities as well as WiFi, flat screen television and DVD player (Netflix, Hulu included on Smart TV.) As well, safe and secure off street parking in our Tenant's Only parking space. Perfect location for family and/or friends vacation. Ideal setting, with beautiful views of Belfast Bay. With 200+feet of beach, the house offers guests hours of relaxing fun with swimming, exploring, beach walking, or paddle boarding. Paddle boards and life jackets are available for guest use. The house is very spacious with plenty of room to spread out. Fully equipped kitchen, including all you need for a lobster feast. Plenty of games, puzzles, and books to entertain all ages.